How to Choose a Wedding Cake Whether you decide to get married? Of course marriage is a mandatory thing for all of us, but there is a memont should be noted as taking Photo with wedding dress, take pictures with my friends. But it would be more complete if the atmosphere we serve with a special wedding cake. 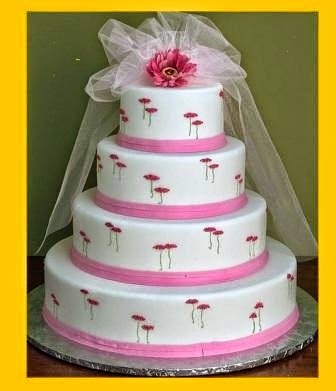 Well this time I am very interested to discuss about tips or how to choose a cake for a wedding reception. Here are some simple ideas that may give you inspiration or input when you want to choose for a wedding cake. 1. Plan well in the beginning long before your wedding reception. Before the draft or your wedding cake should choose a suitable design and fit with your weeding, Look at the photo-photo or picture in a magazine or the internet as a reference and inspiration. 2. Start searching for ideas Read wedding magazines featuring cakes, Look at the online store of wedding cake idea and you also have to See in the family photo displays on the idea of ​​a wedding cake. 3. Design a cake Decide on your design concept or maybe you already have for planning a wedding. Begin to discuss the design to your partner about the design. 0 Response to "4 Tips on choosing a wedding cake for the reception"